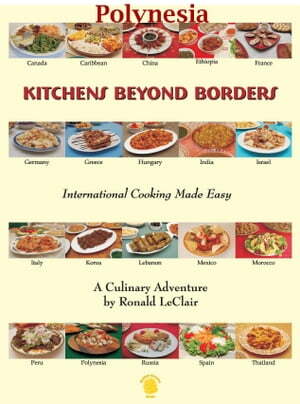 Collins Booksellers - Kitchens Beyond Borders Polynesia by Ronald LeClair, 9781310500213. Buy this book online. This is one in a series of 20 short cookbooks for international food lovers everywhere. It showcases traditional and popular dishes from 20 different countries. A collection of all 20 in one file is also available. The format is buffet style, whereby all the dishes from one particular country are placed together on the table. A full menu is meant to serve twenty guests, but, because of its flexible possibilities, serving smaller numbers is also easy. You can make dinners for two or more; you can make single dishes. You can use our sides or salads with your own favourite main dishes. The guesswork needed when placing various combinations together is eliminated; any and all recipes in one particular set will always complement each other. Cooking methods are simplified and readily available products were chosen. Cook from scratch using fresh and healthy ingredients. No need to open cans or use processed foods while controlling sodium and sugar intakes. Many recipes can be made in less than one hour. We created for you all original variations that have been tested and proven in home kitchens.